The Alsace region is best known for the high-quality white wine. They also have some of the best food you can find - foie gras, choucroute garnie à l'alsacienne, etc. 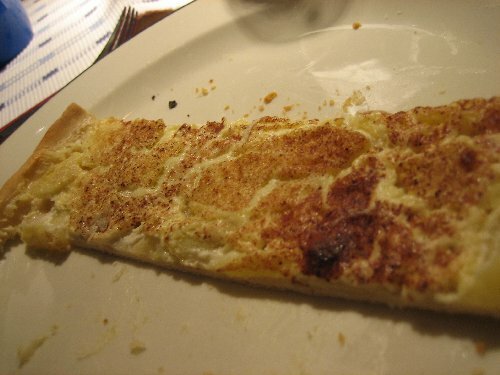 A speciality of the region is Flammkuchen, a thin-crust simple pie. 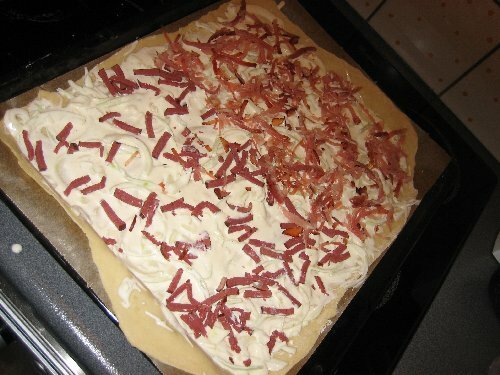 It may look a bit like a pizza but it's very different; there's no tomato, no basil, no cheese. 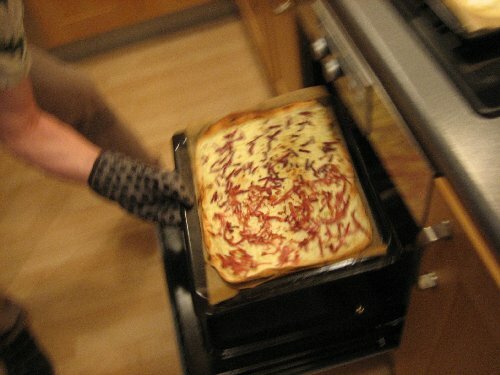 S and I tried to make Flammkuchen at home. It went quite ok I think. Hi-res images are available at Flickr. 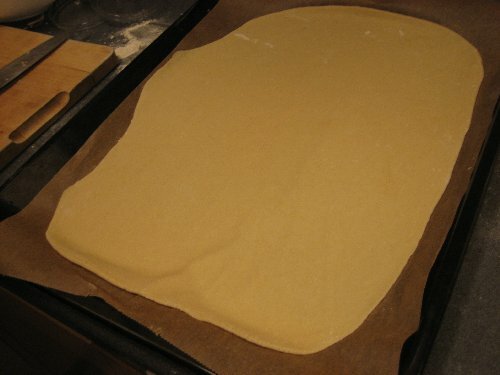 We started with 200g of wheat flour, 100g cold water, 2 tablespoons of oil. 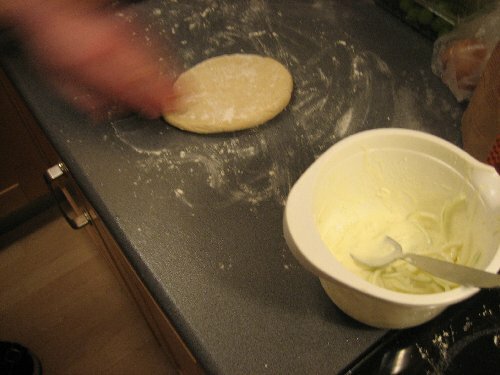 Mix and make a dough. Leave to rest. 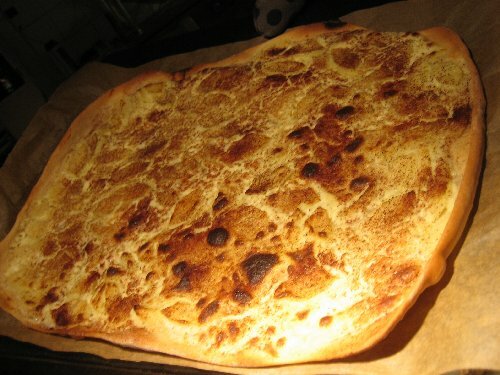 Many online recipies use yeast, but this is not really needed we think. 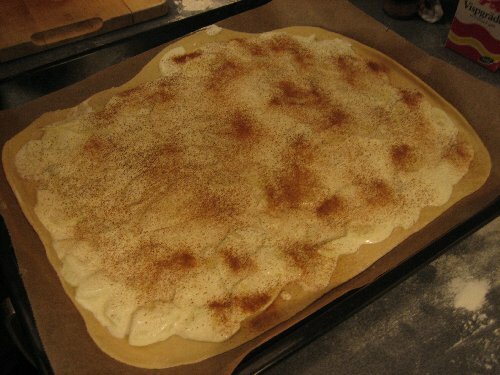 Make sure the dough is really thin. 1-2 mm. 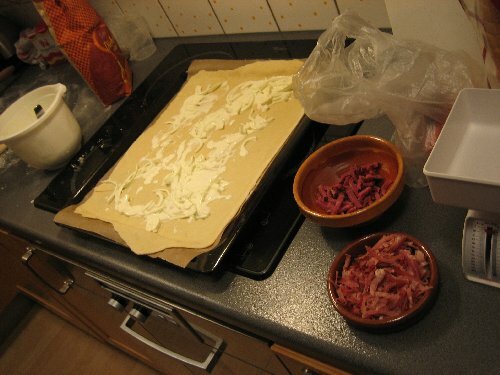 As filling, we used low-fat creme fraiche, one chopped onion, smoked ham from Schwarzwald, and - as an experiment - smoked reindeer. Stick with the ham. We mixed the creme fraiche with a little double creme to make it more liquid. Spread this and the onions as a base, then finish with the ham. 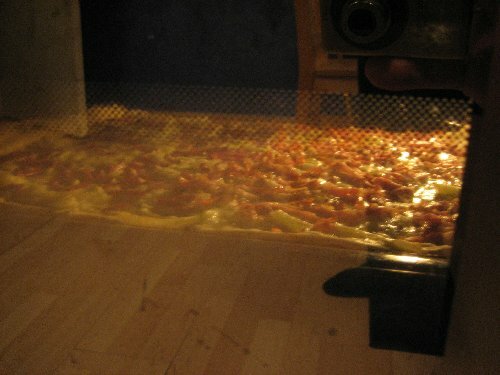 Bake in 250°C, with oven fan on. Not everyone thinks baking is fun, and they will try to distract you. Watch the oven! Bake until it gets some color, but not too much. About 15 minutes. 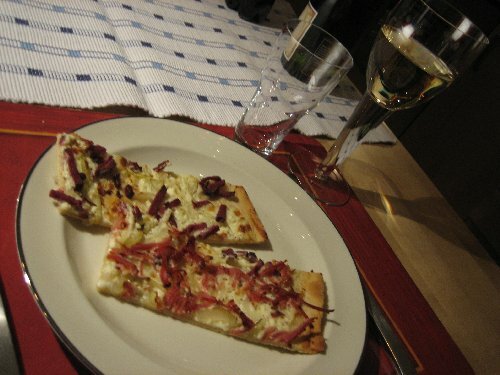 It is traditionally served on wooden plates, cut into smaller pieces, like this. Of course, this is an excellent excuse to drink some Alsace wine. I would recommend Riesling or Pinot Gris. 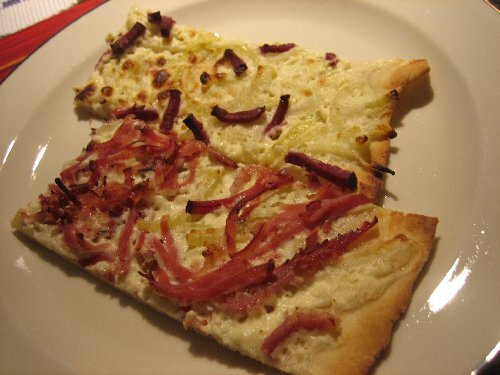 There are two kinds of flammkuchen (that I know of), the one with ham, and one with apples. We tried the apple thing too. 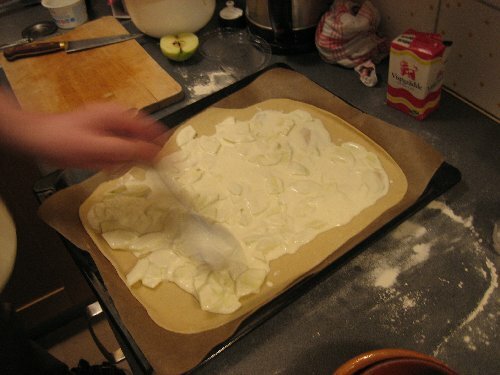 Again, a mix of creme fraiche and two apples cut into very thin slices. Just a little cinnamon on top. Content updated 10 March 2019. 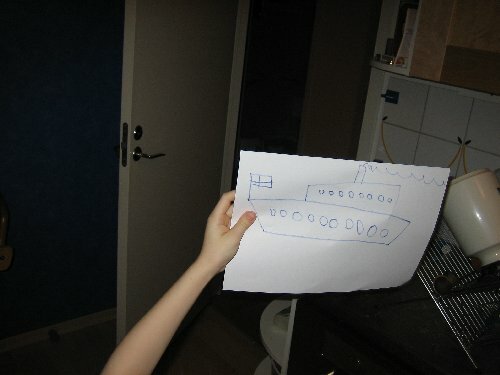 <URL: http://boralv.se/blog/?id=1144050250>.